Home → Hangers → Children Hangers → Children's Suit Hanger 10"
Our 10" wooden children's suit hangers are perfect for displaying children's tops, pants or both! Features chrome cushion clips that are adjustable in width, chrome hook, and notched shoulders. 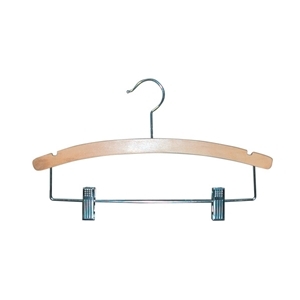 These quality, natural wood hangers are durable, affordable and constructed for many years of use.